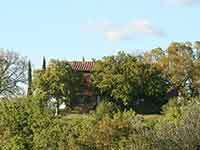 Asciano is a comune and hill town in the province of Siena in the Italian region Tuscany. It is located at the centre of the Crete senesi between the river Ombrone and the torrent Copra, some 30 kilometres (19 mi) southeast of the town of Siena by rail. Asciano has origins as Etruscan, Roman and Lombard settlements. A 5th century BC Etruscan necropolis has been excavated nearby and remains of Roman baths, with a fine mosaic pavement, were found within the town in 1898. 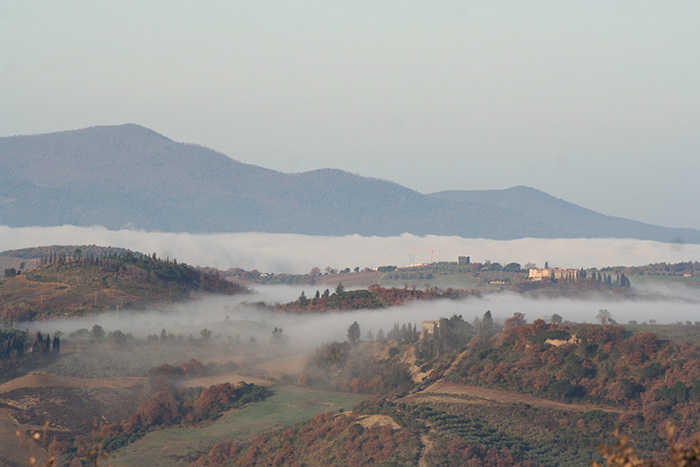 During the medieval period its location made it a site of contest between Siena and Florence: the Battle of Montaperti was fought in the nearby on 4 September 1260. The village was purchased by the Sienese in 1285 and surrounded by walls in 1351, and has some 14th-century churches with paintings of the same period. Asciano has the 11th century Romanesque basilica of Sant'Agata which was built of travertine. The church, with its aisleless nave topped by a truss roof, is adorned with decorative elements of the Lombard type. Outside is its 13th century campanile. The interior houses two 16th-century frescoes, one by Il Sodoma and a Pietà attributed to Bartolomeo Neroni. Adjoining the church is the Museo d'Arte Sacra where works by painters in the Sienese manner of the 14th and 15th centuries are exhibited. The Museo Archeologico contains finds from the excavation of chamber tombs from the cemetery of Poggio Pinci. 10 kilometers (6 mi) to the south is the large Benedictine monastery of Monte Oliveto Maggiore, mother-house of the Olivetans and founded in 1320. 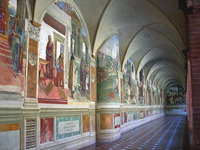 The cloister is famous for the series of frescoes illustrating scenes from the legend of St. Benedict begun by Luca Signorelli and completed by il Sodoma in 1505. The latter master's work is perhaps nowhere better represented than here. The church contains fine inlaid choir stalls by Fra Giovanni da Verona. The buildings, which are mostly of red brick, are conspicuous against the grey clayey and sandy soil—the crete senesi which give this area of Tuscany its name. The monastery is described by Pope Pius II in his Commentaria. Asciano hosts two of the most interesting museums in the Crete Senesi, Palazzo Corboli, which contains the Archaeological and Sacred Art Museum, and the Amos Cassioli museum, which houses a collection of Sienese paintings from the 1800s. The Medieval Palazzo Corboli was owned by the Bandinellis, a noble Sienese family, whose code of arms are present in the decorations throughout the building. There are numerous traces of frescoes in the various rooms. These include the two cycles of allegorical frescoes, dated the 1300s that decorate the Chamber of Aristoteles and the Chamber of the Four Seasons, splendid pictorial cycles attributed to the Sienese Cristoforo di Bindoccio and Meo di Pero. 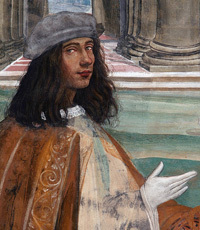 The Sacred Art Section hosts numerous examples of Sienese painting, including works by Giovanni Pisano, Segna di Bonaventura, Lippo e Federico Memmi, Ambrogio Lorenzetti, Francesco di Valdambrino, Matteo di Giovanni, Paolo di Giovanni Fei e Giovanni di Paolo. The second and third floor is home to the Archeological Section, dedicated to the evidence of the Alta Valle dell'Ombrone, and hosts rich apparel coming from the excavations of the Poggio Pinci necropolis and the Molinello tumulus (in Asciano), the Poggione necropolis (in Castelnuovo Berardenga), and the Roman Baths of Campo Muri (in Rapolano). The annual music festival under the artistic direction of Philippe Herreweghetakes place in the beautiful region of the Crete Senesi in southern Tuscany where, every summer, the distinctive and alluring landscape positively teems with musical life. On dream locations such as the churches of Santo Stefano (Castelmuzio), Sant'Anna in Camprena (Pienza) and San Francesco (Asciano) both music lovers and art addicts will enjoy this event. From 2017 the festival is organized by Collegium Vocale Gent, with a home address in the birthplace of Philippe Herreweghe. In Asciano, the Collegiata di Sant'Agata and the Chiesa di San Francesco are recurring places to host a concert. Because of their acoustics, some small churches and monasteries of Asciano, Castelmuzio and Sant'Anna in Camprena are the perfect setting for these authentic concerts. In 2018 there is also a concert in the Abbey of Sant'Antimo. 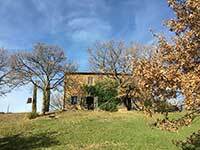 Great holiday house with quiet and beautiful surroundings. Foto di LigaDue, licenziato in base ai termini della licenza the Creative Commons Attribution 3.0 Unported. Chisholm, Hugh, ed. (1911). "Asciano". Encyclopædia Britannica. 2 (11th ed.). Cambridge University Press. p. 722, text now in the public domain. Questo articolo è basato parzialmente sull'articolo Asciano dell' enciclopedia Wikipedia ed è rilasciato sotto i termini della GNU Free Documentation License.